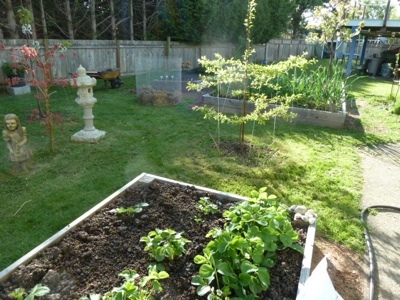 My Home and Garden: An incredible day in the garden. We built our first potato tower. An incredible day in the garden. We built our first potato tower. I think it cost about $25.00 for the wire to build our first potato tower. It's one of those crazy things. Could we even grow enough potatoes in the ring to ever pay for the wire? Probably not. But, I enjoy it so much. I want to try to grow everything!! Here is a close up of the tower and a view of the area it's in. Look how many things are growing in the yard now. Oh I'm happy. Do you fill it with straw? Or what? Do you start at the bottom and add stuff as the potato grows? Hi Joan. 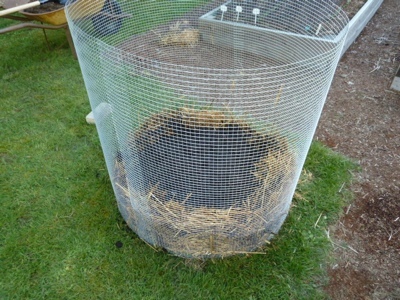 We are going to use it to hold the soil in the wire ring. We will be piling more dirt in as the plants grow upwards. I am also trying a sweet potato this year.